Safety and security. Two words that are first to mind when you think of a secure financial institution. Two words that Federated bank strives to provide our customers. 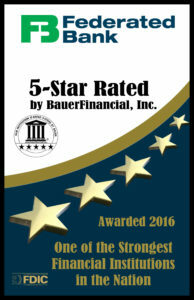 That’s why Federated Bank is proud to be rated a 5-Star Superior Bank by Bauer Financial. Bauer Financial has been analyzing and reporting on the performance of U.S. banks and credit unions since 1983. Ratings are independent. Federated Bank does not pay to be rated by Bauer Financial, nor can we choose to be excluded from the ratings. There are many questions that you have to answer today. If your bank is safe shouldn’t be one of them. It won’t be if you choose to bank at Federated Bank. To learn more about Bauer Financial and the rating criteria they use, you can visit their website.